In this blog we will cover the basics of configuring UniFi Zero-Handoff Roaming. We will be using two UAP-Pro Access Points. - Zero-Handoff is available from UniFi Controller version 3.x and above. - Zero-Handoff Roaming currently works with all UniFi AP models as of writing except for the UAP-AC Access Points. - Zero-Handoff is configured by creating a separate WLAN group in the controller and enabling the Zero-Handoff feature for this group. - All UniFi AP's using Zero-Handoff will be set to the same channel / frequency (configured when enabling Zero-Handoff). - Zero-Handoff Roaming requires WPA (Personal or Enterprise) Encryption. - Ensure you are running UniFi Controller version 3.1.6 (or at least 3.x). - Ensure your Access Points are connected and have been upgraded to the same version firmware as the controller. - This scenario assumes that you have already performed a site survey with suitable cell overlap (Access Point placement, Tx Power adjustment and Minimum RSSI value can help with this - See more on Site Survey Planning and Deployment). Navigate to Settings > Wireless Networks and Add a new WLAN Group by clicking + next to the default WLAN Group. Configure the new WLAN Group. Click Create under the newly created WLAN Group to add a new SSID for Zero-Handoff Roaming. Create an SSID for the default WLAN Group (which does not use Zero-Handoff by default) by selecting the WLAN Group default and then selecting Create to Create a New Wireless Network. This will be the non Zero-Handoff Wireless Network that applies to any radio's on Access Points not configured in the next step and in this scenario will include the 5GHz radio's on the UAP-Pro AP's we are using. We are now ready to tell the radio's on each Access Point which WLAN Group to use. On each Access Point that you whish to use Zero-Handoff Roaming - Click the Settings icon of the AP and Navigate to Configuration > WLANS and change the WLANS 2G WLAN Group to our Zero-Handoff Group. For the UAP-Pro AP's 5GHz radio's and all other 2.4GHz UniFi AP's you do not wish to implement Zero-Handoff, leave the these radio's WLAN Groups to the default WLAN Group. in order to keep the roaming active is necessary to have the controller software always up? We don't know if is required to have the controller software always-on or is just to setup the initial configuration. Do all the AP's need to be the same channel? Any alternatives, as I am worried about the performance having 3 AP's in close proximity on the same channel. Yes, Stephen, ZH needs access points on the same channel and some coverage overlap to function. 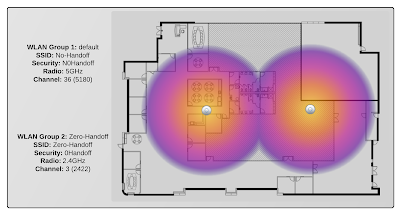 If your access points are in very "close proximity" or if you have a high density of active wireless clients then you may want to skip ZH to mitigate the negative impacts of channel interference and the "hidden node problem" (http://en.wikipedia.org/wiki/Hidden_node_problem). Ubiquiti says... "ZH Roaming should not be enabled on High-Density WLANs. This is because ZH requires the same channel be used on all access points across the BSSID. 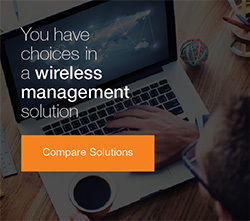 In addition, all associated wireless clients are using the same channel. So in a high density environment, when ZH is enabled, the channel faces overuse. Stations will experience higher latency and lower throughput. When planning a wireless network, decide whether the environment needs High Density or Zero-Handoff." (https://community.ubnt.com/t5/UniFi-Frequently-Asked-Questions/UniFi-What-is-Zero-Handoff/ta-p/412719). I have a network with three UAP outdoor + ,each configured with AMO-13 antennas and have a distance of 200 feet apart .The maximum client threshold is 40 across the network but i notice that there is no roaming because each client just stays assigned to one radio permanently regardless of the existence of a closer AP.Would you use the ZH feature in this scenario? Hi Mark - What is you cell overlap like? 200 feet apart could still be quite a strong signal. i.e. 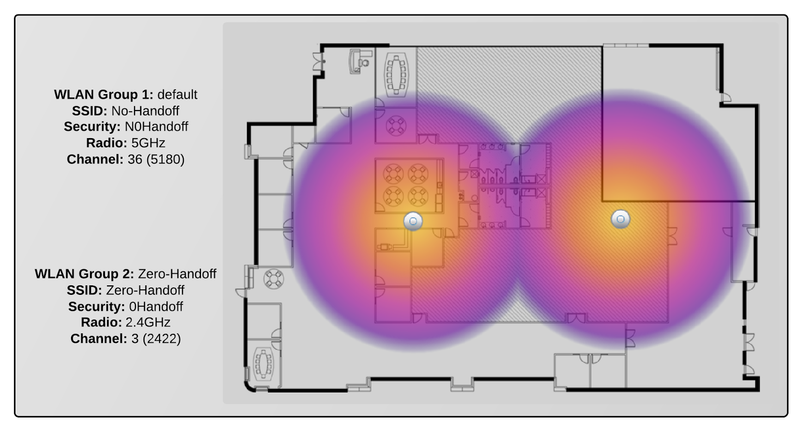 if the wireless cell size of each AP is overlapping by 50-100% and at a high signal it could cause this. Have you tried lowering the power down on all AP's? Can I create two wlan that are Zerohandoff one for 2G radio and the other for 5G radio and issue one for the two bands Zero handoff ? Yes you can create multiple WLAN groups (one for 2.4 and one for 5GHz) and then assign different WLAN groups to each radio on a dual band UAP. I can publish the same SSID in the two WLAN Zero Handoff ? Mr.Daniel Allin it's very helpful to me for knowledge purpose. I have clarification, Unif products discover the AP's of Rocket M type on the MENU of the AP. There in the images two Unifi AP and one Rocket M type AP discovered. Can i implement that manner..? Hi there, I'm not quite sure what you mean sorry. Are you referring to the Rocket M or the UniFi Outdoor+ as they look very similar in photos? If you are referring to the Rocket then it is not compatible with the UniFi Controller software. Hi, I have a hotel with about 30 AP Pro's. They want to run SIP handsets across the network now and with ZH not configured it clearly doesn't work very well. They have 5 AP's on every level and when doing some testing each AP only seems to be able to see two other AP's around them I have read the note about the high density on the UBNT forum but not sure what they class as high density and if this situation fits into that. I am looking at running the ZH on the 5GHz as I would still the 2.4 to be used the general guest network they currently have running. Just chasing thoughts on what you think. Hi, When implementing Zero-Handoff a key setting for it to function correctly is to set the minimum RSSI value, this value pushes clients to the next available AP once they reach the RSSI. For this to work you will want to ensure your AP's do have sufficient cell overlap (If each AP can see two other AP's ensure that this is on the 5GHz (not 2.4GHz) and that the overlap is sufficient enough that when a device is at the edge of the cell they are still getting a good enough connection (data rate) for the amount of traffic required for their application (SIP, Web, Video etc). Also ensure you are running the latest UniFi Controller for the latest zero-handoff improvements, and test a small area (4-5 APs for example) before implementing over the whole network. Hi Thanks, for that. I have set it up as per your instructions but have used a 5Ghz channel instead of 2.4 but none of the devices can see the network. I am using a mix of iPhone 5's and iPhone 6. Any ideas? Which 5GHz channel did you select for the Zero Handoff Roaming channel? is this a channel that your devices are able to see? i.e. if you have used upper band channels for outdoor use your indoor clients may not be capable of communicating on this channel. To troubleshoot try 5180 for a start as this is an indoor channel and all 5GHz capable devices should see this. i have 2 unifi, i want to configure different name,the same password. when i walk to unifi numerber 2, it connect to unifi number 2 or not ? if not connect, how do i can ? Hi there, yes you can do this. create to wireless networks (with there different names but same password) and then use the override setting under each access point/device configuration. on each unifi on the map click Configuration > WLANS > click override on one of the wireless networks, then on the other unifi click override on the other wireless network. On your wireless clients (mobile/laptop) you will need to connect to both first and they will only automatically change from one to the other if the signal is getting low.